For two autumn nights, a strange and wonderful sight could be observed in small churchyard in Croton-on-Hudson. 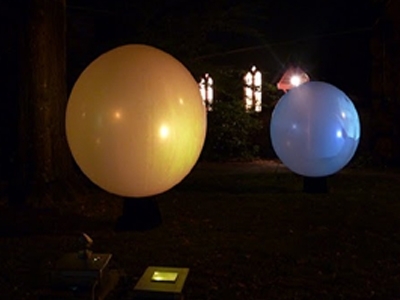 Gene Panczenko and I set up large weather balloons and projected a variety of strange video images onto the balloons. Colorful abstractions and simple silent narratives looked bizarre and magical under these circumstances. On more than one occasion, a passing automobile stopped to investigate the scene!